Whether it’s the economy and a wistful yearning for simpler times or it’s just that artistic zeitgeist that percolates the same idea in several creative venues, brands have released modern versions of their vintage watches. Some examples include the Vacheron Constantin Historiques Aronde 1954, IWC Portofino and Jaeger-LeCoultre Tribute to the Deep Sea Alarm and Grande Reverso Ultra Thin Tribute to 1931. Chronoswiss also digs into its archives and decided to reissue the sporty Pacific, which was originally launched in the 1990’s. With the Pacific, Chronoswiss takes inspiration from the largest ocean and the pioneering and innovative spirit of Captain James Cook, who bucked all naysayers and proved that the marine chronometer could determine longitude and therefore keep a boat from wandering off course or into danger’s path. When Chronoswiss named the Pacific, they took the connotation seriously, imbuing the watch with all the qualities and functionality its namesake implies, such as water resistance to 100m, high legibility and a handy day and date window at 3 o’clock. Back in the 1990’s Chronoswiss issued the Pacific as a trio and following this same model, is introducing the three-handed Pacific, Grand Pacific and a Pacific Chronograph. Additionally, the new Pacific offers a high, slightly domed sapphire crystal, which is ground inside and out, a characteristic found on high quality watches in the 1950’s and 60’s. 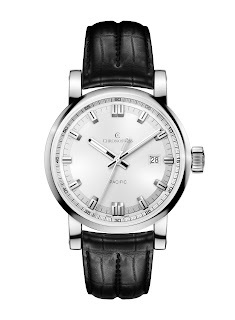 While a lot of watches look the same and require a closer look at the dial to identify the company, German-based Chronoswiss set out specific DNA codes and those remain true in the Pacific including the screw-mounted strap bars, vertical polishing on the case and a modern rendering of the onion-style crown. Giving the Pacific an extra stylistic touch the crown can only be identified from the side. Known for their meticulous case construction, Chronoswiss doesn’t cut corners here, this one with a polished finish and constructed of 25 parts. Dials of all three models have sunburst finishes. 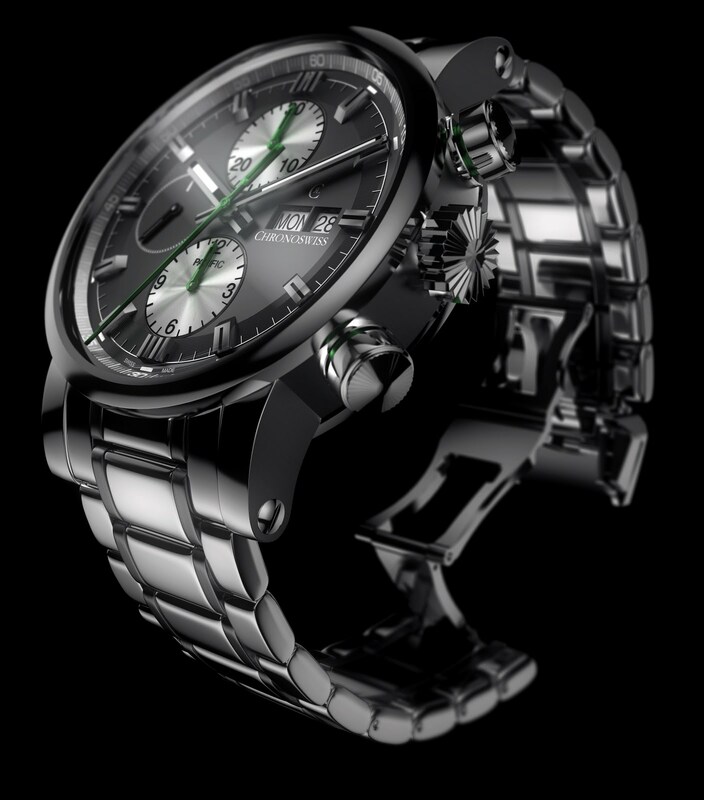 The Pacific offers silver plated, galvanized black or brown applied markers, the Grand Pacific silver plated galvanized black, applied markers, while the Pacific Chronograph comes with galvanized black, applied markers. 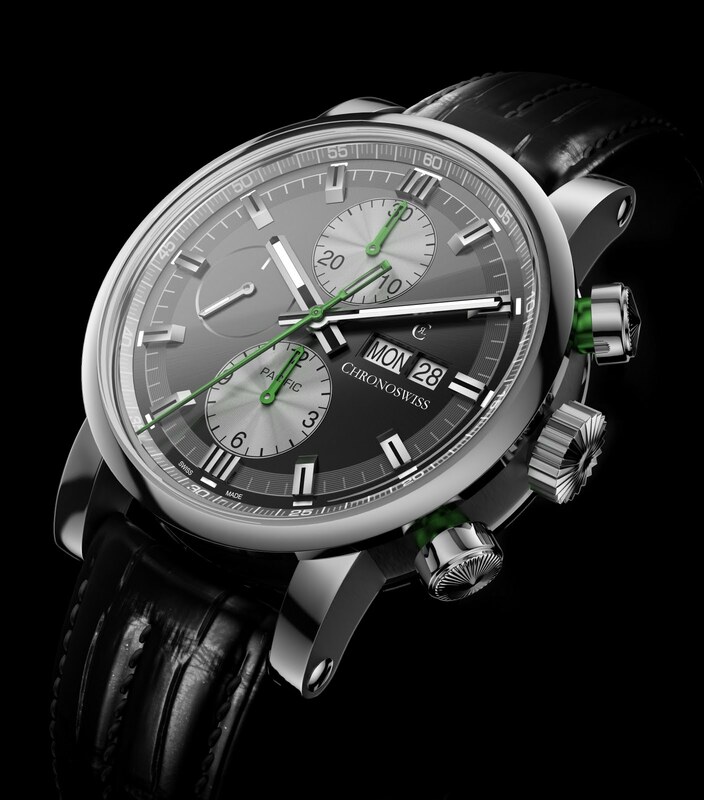 What makes the chronograph really pop are the luminescent green-colored accents on the chronograph, 30-minute and 12-hour chronograph hands, underneath the pump pushers and as an option on the stitching of the black crocodile skin strap. An ETA 2892-A2 powers the three-hand Pacific and Grand Pacific and for the chronograph Chronoswiss chose the ETA 7750. Through the exhibition back, you can view the high level of finish: the skeletonized and rhodium-plated rotor and bridges with côtes de Genève, polished pallet fork, escape wheel and screws and plates with perlage. 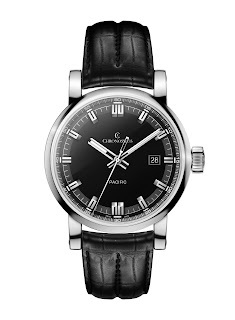 Chronoswiss has created a worthy tribute to the original Pacific, a modern interpretation that is rugged enough to accompany you out in the field yet elegant enough under your suit sleeve (yes it will fit) at the office.